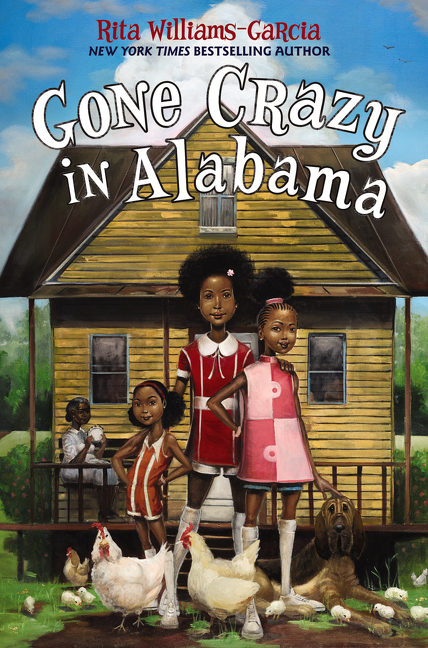 History, self-awareness, negotiated boundaries and family secrets are at the heart of Gone Crazy in Alabama, the third – and final – book in Rita Williams Garcia’s excellent Gaither Sisters series. Sisters Delphine, Vonetta, and Fern travel from Brooklyn to Alabama to spend their summer visiting their grandmother, Big Ma, and her mother, Ma Charles. In Alabama, the cultural shock they face is only the beginning of their problems: there is also the matter of meeting Uncle Darnell for the first time since he betrayed their trust, the discovery that their family has feuds and long kept secrets and dealing with the evolving dynamics within their own group. Ma Charles lives across the way from her half-sister Miss Trotter but they don’t talk to each other apart from hurling insults back and forth through a third party. Middle sister Vonetta takes over that role with aplomb not only because of her propensity for theatrics but also because this allows her to have a degree of power within their family. This is the core of the ever-present conflict between the three sisters since Delphine is always in charge – it’s a role she has taken for herself but one that seems expected of her by the older members of their family. It’s a lot of pressure for a girl of thirteen and this is deftly explored in this novel in a way that nearly broke me. This is also a book that delves deep into storytelling and history. The youngest sister Fern is developing her poetry skills, following in her mother’s footsteps. In here, Fern is more Afua than Fern (and God, that moment when we learn where the name Fern comes from. MY HEART). Vonetta is all Vonetta though and as she carries back and forth the stories that Ma Charles and Miss Trotter tell, she becomes increasingly confident – those stories when they leave the older ladies’ mouths are rooted in southern tradition. When Vonetta retells them, she is all modern and theatrical. More than that, those stories concern their past, the half-truths about their bigamist father and the terrible consequences of his actions. But they are also entrenched in America’s racial history and the kids come to learn their African-American family is entwined with Native Americans and whites in truly hurtful ways. This leads to the most impacting scene for me in Gone Crazy in Alabama with Delphine’s realisation of what being oppressed truly means. One of the greatest things about this series is the balance between the deeply personal and the wider historical context of American society in the late 60s. The series takes place against the backdrop of the Civil Rights and Feminist movements and they are there at the forefront in books one and two. In here, the younger kids become the voice of modernity having spent some time with the Black Panthers and living in Brooklyn. But their modernity and awareness is often in contrast with their more traditional grandmother, Big Ma. Big Ma’s internalised racism is quite probably one of the saddest things about this series. Delphine and Big Ma are constantly butting heads throughout the novel: Delphine calling out the ways that Big Ma “oppresses” her by telling her to iron sheets or take care of house duties. Delphine is finding her voice and is insistent on experimenting with the boundaries of her freedom, which his awesome and even funny. But then one day, the family – subserviently and convivially – welcome into their homes a White cousin, the town’s sheriff and a known member of the Klu Klux Klan. They do so because they have no choice, they do so at the expense of their pride, they do so because it would be dangerous otherwise and Delphine is completely horrified and finally understands. There is a lot to digest here and once again, Rita Williams Garcia awes me with the complexity of her writing. There is layer upon layer to discover in this series. It’s hard to say goodbye to these beloved characters but it’s even harder to say goodbye to the way Rita Williams Garcia infuses their story with depth and heart.